Do I Need To Create A Darkroom? The darkroom is one of the most important parts in the screen printing and having the proper darkroom supplies is very important to the screen printing process. Without a properly set up darkroom you allow many different variables into your emulsion and exposure process that can affect your results dramatically. A proper darkroom should be light safe, which means there are no UV rays present in the room or coming from outside of the room. A darkroom should also be fairly dry and stay between 65-75 degrees if possible. If your darkroom is too humid you will have problems drying your emulsion. 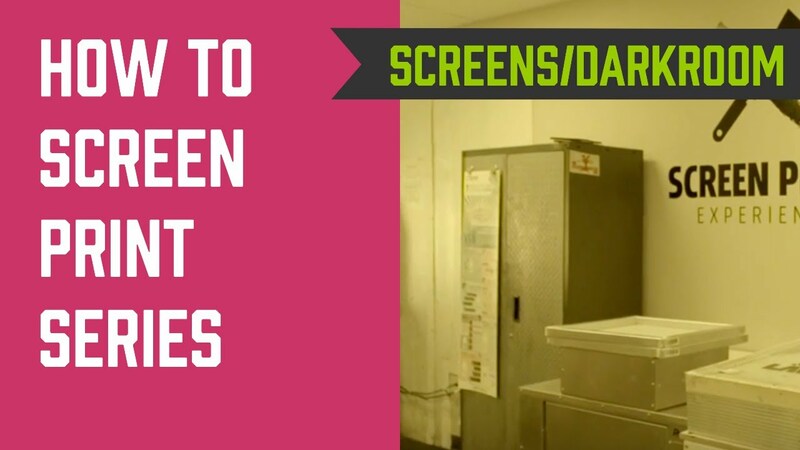 You may also have your washout booth and dip tank in your dark room allowing easy access to screen washout after exposure. The more variables you take out, the fewer problems you will have. Since the emulsions we use need to be in a light safe environment prior to exposure it is in your best interest to create a light safe environment or a darkroom. This can be a dedicated room or even a bathroom with a yellow safe light. Heres how to go about creating a darkroom. In the past the way of thinking was to have a darkroom that was light safe, painted black with red light and dust free, this was used for photography and storing screens in them followed suit. Today the same requirements of being was light safe and dust free hold true with a few minor changes. The light in the room can be yellow, using either a yellow bug light or fluorescent tubes with yellow sleeves. Screens arent as sensitive to light as photographic films and the yellow light allows better visual inspection of your coating. Concerning the color of the walls again black was used to keep any light from reflecting and exposing film, a good idea but very hard to work in with a red safe light. Paint the walls in a semi-gloss latex using a pink or rose color, this allows for greater visibility, the pink walls will reflect a pink light versus a white light and is completely safe for screens. Your darkroom should still remain tightly sealed from outside light and dust. Ventilation is VERY important, a sealed room with wet screens will never dry, placing a fan in the room will circulate air but its still wet air and will kick up dust onto your screens. The most affective system is to buy a Dehumidifier to pull any moisture from the air and dry the screens completely and quickly, however do not place the unit IN the darkroom only because the water gathered is the room. Measure the face of the unit and cut a hole in the wall to mount the Dehumidifier into the opening, you will then seal the edges to prevent light and dust from coming in and keeping moisture out. Now your pulling the moist air out, your water is collected outside the darkroom and not being re-circulated, your screens are drying quickly and completely. All this effort leads to longer print runs without breaking down, better edge definition and you have the beginnings of the perfect screen room.